Managing IT services has rarely been as challenging as it is today. Service and support staff face continuously escalating demands and complexity, which increase costs, drag down productivity and hamper the effectiveness of the IT department in supporting business goals. 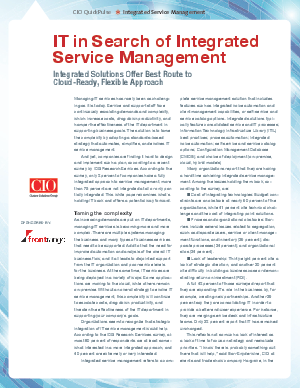 The solution is to tame the complexity by adopting a standards-based strategy that automates, simplifies and evolves IT service management. And yet, companies are finding it hard to design and implement such a plan, according to a recent survey by IDG Research Services. In the survey, only 2 percent of companies have a fully integrated approach to service management; more than 75 percent are not integrated at all or only partially integrated. This white paper examines what’s holding IT back and offers a potential way forward.